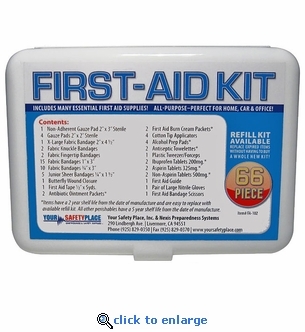 This premium, small-sized, 66-piece first aid kit is perfect when you need to travel light. These small first aid kits are perfect for your glove box, jacket pocket or backpack. Each kit comes in a hard plastic case and includes many essential first aid supplies. 1 - X-Large Fabric Bandage 2" x 4.5" x 3"
15 - Fabric Bandages 1" x 3"
10 - Fabric Bandage 1/4" x 3"
5 - Junior Sheer Bandage 1/4" x 1.5"
1 - First Aid Tape .5" x 5yds. 5" x 3½" x 2"